Save money and energy. Comfort Services, Inc. will help you be more energy efficient and reduce your utility bills. Today it's more important than ever before to make our homes more energy efficient. The cost of our most common energy sources — electricity, natural gas, propane and fuel oil — is likely to keep rising because of increased global demand, political instability, and the increasing difficulty of extracting dwindling supplies of fossil fuels. Improving home energy efficiency helps homeowners to be more financially secure by reducing monthly utility bills. At the same time, homes that use less energy help to save the environment by reducing carbon emissions that cause air pollution and global warming. It also makes your home more comfortable and saves you money. It makes you feel good that you've done something worthwhile for everyone. We at Comfort Services, Inc. value all aspects of efficiency and conservation, which is why we aim to assist our customers in the many ways to save energy and money, upgrade your home, and conserve energy! Contact us today to schedule a home energy audit to identify the areas in your home that could use the energy updates, or to learn more about weatherization, water conservation, low voltage lighting and energy efficient appliances in Pinehurst, Southern Pines, Aberdeen, and more neighboring areas! We provide a whole-energy audit for a comprehensive range of energy-saving improvements, from attic insulation and new water heaters to solar systems and more. This is a common question among homeowners interested in saving energy. It's understandable to be confused because houses use and lose energy in numerous ways. Building scientists, who study how houses perform, explain that a house is a collection of different systems that interact to affect outcomes such as durability, comfort, energy consumption and even health factors such as indoor air quality. The first step on the path to improved home energy efficiency can vary based on the specific conditions a home energy expert encounters and the homeowner's priorities. For example, a homeowner may elect to replace an old water heater as the first step because family members are tired of running out of hot water. This is a great priority, but there may be more! Performing energy-saving improvements in a haphazard way isn't a good idea. That's why most people who are serious about saving energy decide to have a home energy audit done by skilled energy technicians, like those at Comfort Services, Inc. A comprehensive energy audit involves testing, inspecting and calculating to produce a complete energy profile —everything from air leakage and insulation levels to HVAC system efficiency, lighting, water heating, appliance efficiency and more. With a complete home energy audit from Comfort Services, Inc., you'll also get a prioritized list of recommended improvements —not just what to do, but also what order the improvements should follow. All the home energy upgrades Comfort Services, Inc. performs pay for themselves - so ultimately they are free! Call today to get started! Contact us to schedule a free estimate, today! Call 1-855-800-2275 or contact us online to schedule a home energy audit in North Carolina. 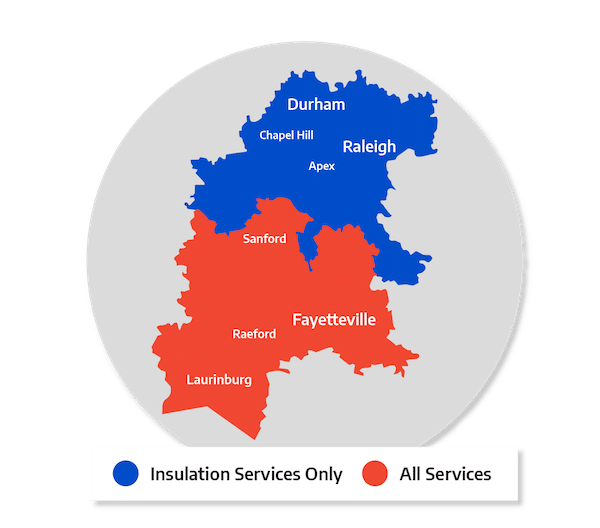 Our professionals serve North Carolina, including Southern Pines, Aberdeen, Pinehurst, Fayetteville, Chapel Hill, Apex, Garner, Durham, Fort Bragg, Fuquay Varina, and nearby areas.